Whether from the dark depths of the ocean or azure tropical seas, heroes rise from beneath the waves. 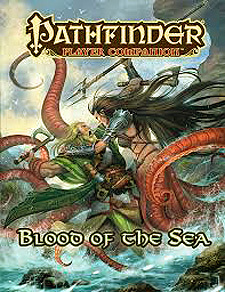 Pathfinder Player Companion: Blood of the Sea explores the mystical paths and strange abilities of sea-born adventurers. Discover the secrets of aquatic elves, gillmen, merfolk, tritons, and more. New magic items and spells aid aquatic characters and land-dwelling characters alike. A host of new archetypes, feats, and other options allow you to infuse your character with the power of the sea. Dive into Blood of the Sea and discover oceans of possibility! Archetypes for a variety of classes, such as the coral witch and the kraken slayer and paladin, as well as a new cavalier order and bardic masterpieces, useful for character in aquatic campaigns. Rules for playing non-standard races like cecaelias, locathahs, and tritons, along with a collection of gear both magical and mundane that can help your heroes in the world beneath the waves. Advice on what to consider when your land-dwelling character must explore the depths and tips on how aquatic characters can overcome the daunting challenges of adventuring on land. This Pathfinder Player Companion is intended for use with the Pathfinder Roleplaying Game and the Pathfinder campaign setting but can easily be incorporated into any fantasy world.